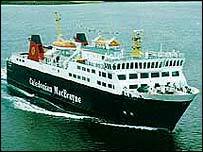 State-owned ferry operator Caledonian MacBrayne has been announced as the preferred bidder for the service to Orkney and Shetland from the mainland. The contract was re-advertised two years ago after current operators NorthLink had financial problems. More than £78m in public money was spent keeping the service afloat. The transport minister said the new service would introduce reduced freight tariffs, a new container system for livestock and more berths. NorthLink, a company jointly owned by CalMac and the Royal Bank of Scotland, is expected to handover the service to CalMac in the summer. Under the six year contract, Orkney will see a 19% reduction in freight tariffs, while Shetland's rates will reduce by 25%. Transport Minister Tavish Scott said the executive was committed to providing quality ferry services for people in the Northern Isles. He said: "Although the tendering was a complex exercise, the new contract is financially sound and delivers real improvements for anyone using the service. "There will now be an intense final period of contract negotiation before the official handover." Conservative transport spokesman David Davidson raised concerns over state-owned CalMac being confirmed as the preferred bidder. He said: "My concern from the start of this process - which was heightened when one of the bidders dropped out at an early stage - has been that each bidder had equal access to the information necessary to make a competitive bid, thereby ensuring that the executive's own ferry operator received no preferential treatment." He also called on the executive to ensure contract was sufficiently robust so as to avoid a repeat of the "costly mistakes synonymous with the original NorthLink tender". The transport minister said officials had incorporated the findings of the independent auditor, Audit Scotland, into the procurement exercise. The financial watchdog had been called in to look at the executive's handling of the NorthLink ferry contract after concerns over the amount of public money it was being given. NorthLink took over the route from P&O in 2002, which had linked the Northern Isles to the mainland for more than 30 years. The agreed handover date and details of the subsidy for CalMac's contract will be provided once discussions are concluded. Bids for the ferry route had been submitted by V-Ships UK Ltd and CalMac. Irish Continental Ferries were also initially short-listed.